I was watching my favorite show on the television and it was just half over when I saw something which was definitely not a part of the show I was watching. My television screen gone blank for a couple of seconds and then what I saw was totally unbelievable for my eyes. It was my friend ‘Rahul Sasi’ on the television and I was still wondering that how did he interrupted in between a television show like happens in Sci-Fi movies, someone hijacks television or computer to deliver some kind of message or warning. Also like in some horror movies in which sometime ghostly images interrupts between the television and suddenly comes out. Oh my god! But, nothing happened like that in my case, my friend didn't came out. Just few minutes later I was again redirected to the same show I was watching, only a part of it I missed, but never mind I’ll watch it on the YouTube later. I think you might be thinking as if I am kidding, but it’s true. My friend Rahul Sasi is a well known Indian security researcher, and founder of Garage4Hackers Forum. This was a surprise demonstration he gave me last weekend on “Hacking Your Cable TV Networks,” which he is going to present next week at Hack In The Box (HITB) Security Conference in Amsterdam. A year back, similar attack was noticed by the Television viewers in Great Falls, Montana, when a hacker interrupted the television show by a message, warning the viewers that "dead bodies are rising from their graves and attacking the living". But, this is going to be the first time when someone will give a Live demonstration on Hacking the cable television networks. From last eight to nine months, Rahul is working with a local cable TV network provider, where he discovered insecure implementations and weak architecture of the Cable TV networks, that could be abused by any potential hacker to carry out large scale attacks. Unlike Internet, Television is one way medium, and if someone hijack any cable TV network service provider and display an emergency alert or a stream in a Video stating that a riot has started in your nearby city. Which in real is only a hoax, perpetrated by as-yet unknown hackers, but can cause enough panic among the people. 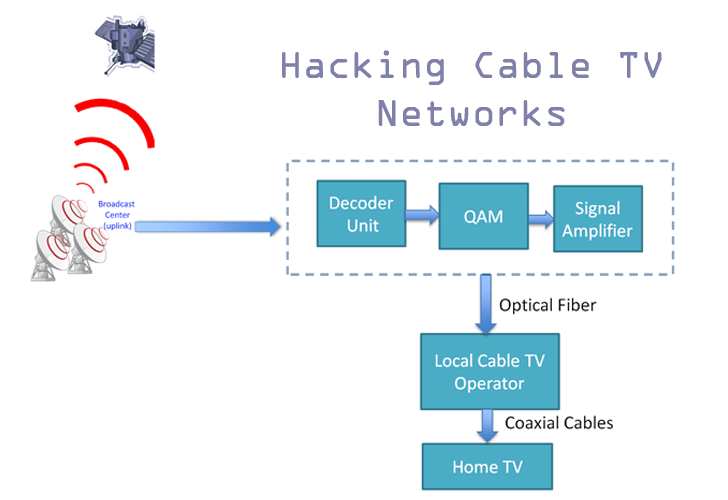 In the presentation, Sasi will demonstrate how a potential attacker can leverage the weakness in the Cable TV networks to hack various standards for the broadcast transmissions including the Analogue Cable TV, DVB-C and IPTV. The technicals details will be revealed in the HITB conference next week. Philip R. Zimmermann, the creator of Pretty Good Privacy, will also join HITB this year as a Highlight Speaker. The Event is also hosting a 3-Days Free Haxpo, a IT security exhibition at Beurs van Berlage, Amsterdam on May 28th, 29th, 30th 2014. "We're excited to be celebrating our 5th year anniversary event in The Netherlands with not only an all-women keynote line but also with our brand new HITB Haxpo - an interactive event for not only hackers but makers and builders which we think will be unlike anything that's been done before. A true celebration of all things ‘hacker’ and a reminder of the original meaning of the word - exploring the limits of what is possible, in a spirit of playful cleverness." Dhillon Andrew Kannabhiran, Founder/Chief Executive Officer, Hack In The Box told to the 'The Hacker News'. Dr. Marco Balduzzi will present some new vulnerabilities and attacks on AIS, Automatic Identification System. Anthony Hariton, a Computer Science Undergraduate student will show you how one can hack Boarding passes to get through all the Airport security checks. Michael Ossmann, a wireless security researcher and Hardware hacker will demonstrate that how you can build your own NSA Playset out of open source components.